Just in time for the release of the movie “Star Wars Episode VII: The Force Awakens,” NASA’s Hubble Space Telescope has photographed what looks like a cosmic, double-bladed lightsaber. “Science fiction has been an inspiration to generations of scientists and engineers, and the film series Star Wars is no exception,” said John Grunsfeld, astronaut and associate administrator for the NASA Science Mission directorate. “There is no stronger case for the motivational power of real science than the discoveries that come from the Hubble Space Telescope as it unravels the mysteries of the universe." 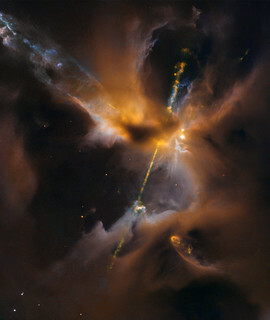 This celestial lightsaber does not lie in a galaxy far, far away, but rather inside our home galaxy, the Milky Way. It’s inside a turbulent birthing ground for new stars known as the Orion B molecular cloud complex, located 1,350 light-years away. Though planets will later congeal in the disk, at this early stage the protostar is feeding on the disk with a Jabba-like appetite. Gas from the disk rains down onto the protostar and engorges it. Superheated material spills away and is shot outward from the star in opposite directions along an uncluttered escape route — the star’s rotation axis. Just to the right of the cloaked star, a couple of bright points are young stars peeking through and showing off their own faint lightsabers — including one that has bored a tunnel through the cloud towards the upper-right side of the picture. Overall, just a handful of HH jets have been spotted in this region in visible light, and about the same number in the infrared. Hubble’s observations for this image were performed in infrared light, which enabled the telescope to peer through the gas and dust cocooning the newly forming stars and capture a clear view of the HH objects. These young stellar jets are ideal targets for NASA’s upcoming James Webb Space Telescope, which will have even greater infrared wavelength vision to see deeper into the dust surrounding newly forming stars.